Free Taxi Cab Website Template! Our Taxi Cab Website Template is Packed with Great Features! Our taxi cab website template design looks and works great - your customers will love the ease with which they can get instant quotes for taxi cab fares, journey details, make bookings and secure payments online. Hide or show 'Request Call Back' form, as required. We also offer an advanced optimisation service for your website to make it unique to the service you provide within your target area(s). This one-time exercise will allow you to take the fullest advantage to secure more bookings online. Contact us for further details. * Your taxi cab website template comes complete with our booking engine technology built-in. For more details see taxi cab website booking system. 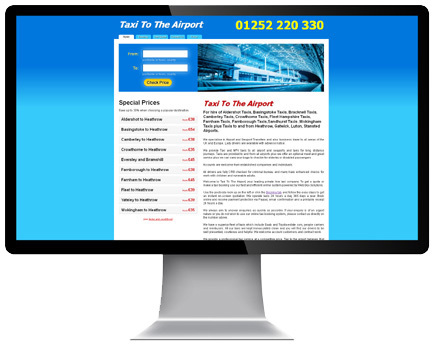 Our Taxi Website Design will save you £1000's! At Webbox Solutions, we keep apace with changes in technology, consumer trends and regularly introduce new features and upgrades to keep you ahead of the competition. Learn more about the benefits of being a proud owner of your own Taxi Cab Website. Sign up today for your free trial of our taxi cab website and start taking bookings and payments online. Pay just £25.00 (+VAT) after the free trial for monthly hosting and license fee. Your website will be ready within 5 working days. 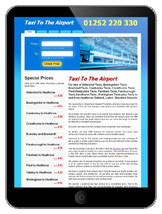 Our Taxi Cab Website Template Targets Customers on Mobile Devices too! We understand the advances in technology and changes in consumer trends. Our taxi cab website template is designed to target customers on both desktops and mobile devices. Our website template will automatically detect and resize to fit on screens from the largest widescreen monitors to smartphones and tablets such as the iPhone and iPad to deliver the best user experience to your customers.